Good through today, (2/24), Groupon is offering an additional 20% off already discounted subscription box deals with coupon code SALE3! Check out our Bluum reviews to learn more. One- or Three-Month Subscription from PetPack (Up to 34% Off) (+ 20% Off with coupon code SALE3). FYI – there is a $5 shipping per box fee with this deal. Get one month of a Deluxe Love with Food box for $9 (plus $2 shipping when you redeem the offer). Plus use coupon SAVE3 to bring the cost down to $7.20. I just tried to redeem my Groupon on Bluum’s site and it’s wanting to charge me $27/box. WTH? NVM sorry I can’t read today! Lol it was subtracting the total after it added it in. The coupon worked for me for a Bluum subscription. The code SAVE3 isn’t working on the Love With Food box. The fine print in the Bluum Groupon says it cannot be combined with other coupons. While the order page initially showed a drop in price after applying the Sale3 coupon code, my receipt shows I paid full price. Hmm I used the Sale3 coupon on the Bluum deal and I paid $76, my receipt and email confirmation say only $76. 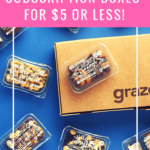 Fantastic deal for a $34/month box!